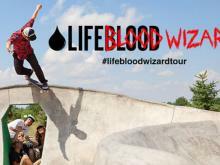 Lifeblood X Blood Wizard Summer Tour - Part 1 from Lifeblood Skateboards on Vimeo. Our minimal budget pretty much affirmed that motel rooms (and daily showers) were going to be slim to none. Still, made it happen with the generous support of Dylan Radloff at Oakley along with new friends and the welcoming offers to camp in their backyards. The road was calling and we were yearning for some great times shared on the road with plenty of skating new skate spots out there awaiting us. Along for the ride were Kevin Kowalski, Dalton Dern, Cody Lockwood, Mason Merlino, Jack Given, Anakin Senn, Jerry Gurney, Chris Gregson, Toad, Johnny Turgesen, Bryce Kanights, Joey Martin, Frank Faria, and Mark Scott. Part 1 delivers 9 minutes of action from a few of the parks that we hit up on our way out to Colorado. There's more to come!